Background noise is one of the most important factors that affect sound transmission. It is an advantage that it is measureable and, under certain conditions, it is even possible to estimate its level. This article is going to cast some light on the problem of background noise and its effects. Sound transmission is affected by a number of factors. These include weather conditions (humidity, altitude, wind, rain, etc. ), environmental noise (traffic, advertising, people talking, bioacoustics noise from animals and birds etc. ), terrain conditions (mountains, hills, tall buildings etc. ), and mechanical noise (heavy machinery, industrial noise, trucks, aircrafts, etc.). Moreover, sound transmission also depends on background noise and the materials used, absorbing or reflecting sound. As a result, all these factors need to be considered in the design of early-warning, mass-notification, and voice- evacuation systems. In rural areas where, for example, the background noise level during a common day is 57 dB, sirens need to be arranged in the way that their audibility is not lower than 55 dB at every point of the area to be covered by warning signal. In urban areas where, for example, the background noise level is 70 dB, the minimum audibility of sirens is set at 70 dB. In industrial areas where, for example, the background noise level is 83 dB, all sirens need to generate warning signal with a minimum of 88 dB. Noise measurements are carried out at the noisiest daily intervals under normal weather conditions. More information about noise measurements is provided in the article: 5 tips how to measure background noise levels. 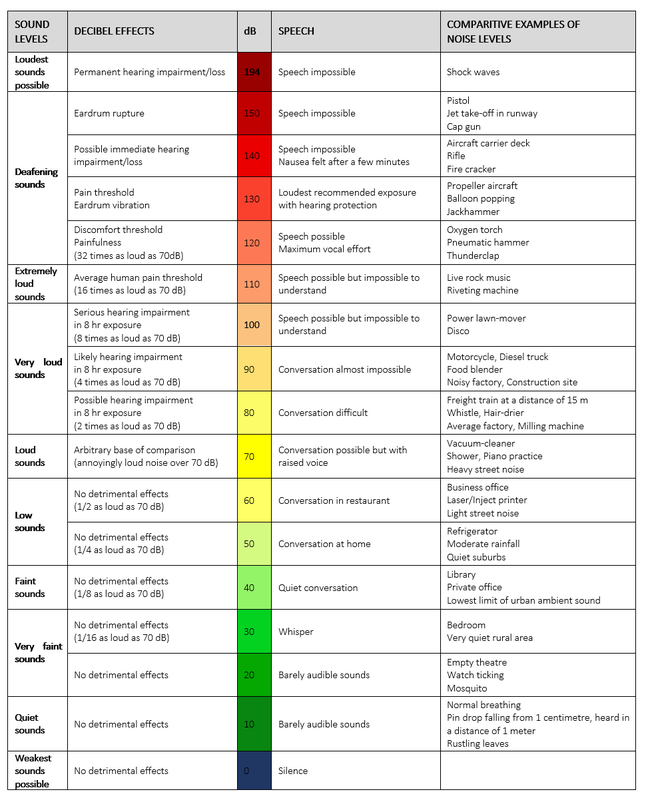 Noise levels, denoted in decibels, their effects on a human body, and several examples of such noise levels are given in the following table. A broad knowledge of sound pressure transmission at a given location has been applied in the development of the Acusticus software. You will be instructed how to set the right parameters for your acoustic project and simulate siren warning signals as precisely as possible in a series of articles regarding the Acusticus software application. Acoustic signal transmission is affected by a number of factors (weather, terrain, and background noise conditions). It is necessary to design a reliable, well-audible early-warning and mass-notification system by means of the Acusticus software which allows the setting of specific parameters according to your needs. In case background noise levels are unmeasurable, the above table might be of some help when estimating them and setting the right parameters.